To see where Villa Lobos Tequila is distilled, is to go back over a century to one of the last distilleries of its kind in Mexico where production is still done by hand in the old fashioned way, slowly and with ‘corazón’ (heart). Unusually, the agave used for Villa Lobos is entirely harvested at the Camarena Family plantations in Los Altos, the celebrated Arandas highlands. This ensures that only the very finest plants with the highest fructose levels are hand selected. Unlike most distilleries using a chain saw for speed and ease of stacking, each agave is chopped in half by a skilled ‘axeman’ who examines its gender: if a male plant, the waxy cuticle near the root, which can impart bitter flavour and impair the quality, is additionally removed with the razor-sharp axe (Cogollo). Almost no one else does this! The halved agave piñas (hearts of the agave) are then slowly cooked in old traditional brick ovens for 36 hours (24 injecting hot steam + 12 hours without steam) and allowed another 24 hours to cool down (most distilleries now use rapid cooking stainless steel ‘autoclaves’ / pressure cookers) but this wouldn’t be good enough for Villa Lobos. Only the local natural yeasts blowing in on the wind through the glass-free open windows are used to ferment the juice, and slowly the bubbling of the juices starts as the yeasts convert the natural plant sugars into carbon-dioxide and alcohol. Fermentation lasts between 4 and 5 days. The fermented juices are then slowly distilled twice. The double distillation process is performed first in a 3,500 liter stainless steel pot still and then in a 300 liter copper pot still. The result of the first distillation produces the run-off known as ‘ordinario’ and eliminates the fatty acids and oily compounds. The second fractional distillation produces the smoothest tequila we can make with the most delicate aromas and flavour. The high alcohols ‘CABEZAS’ (heads) and the unsuitable lower alcohols ‘COLAS’ (tails) are discarded, as we only want to keep and treasure the heart ‘CORAZÓN’. 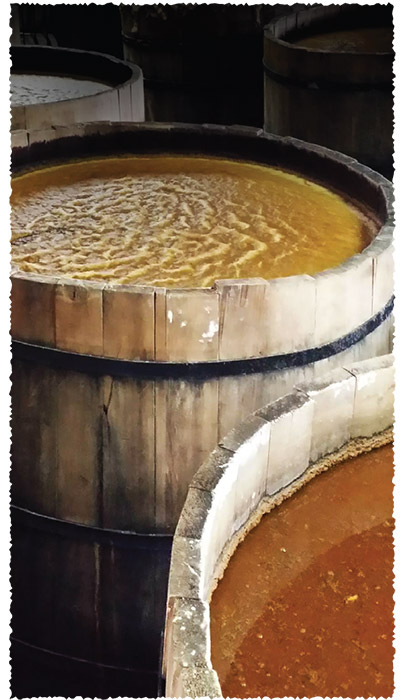 Finally, in a completely unique way, we place the resulting tequila, the Blanco, in steel tanks for 6 months, or more, to allow it to rest and slowly oxidize, so its flavours and bouquet are enhanced. This delay is expensive (normally a Blanco tequila is bottled immediately by most Tequileros), however Villa Lobos is not ‘most Tequilas’! The Blanco thus has an incredibly smooth finish with the famous spicy, white-pepper nose so beloved of the great Arandas tequila houses. Dale describes the delicacy of the Blanco as so smooth that “it’s almost feminine” – which was his intention when he first took the idea to Carlos: it had to be different and it had to be special. The Blanco is left to rest in steel tanks until ready for bottling but the rest of the tequila is taken away and filled into American oak ex bourbon Barrels to mature. Some is bottled after 11 months as Reposado (reposed). They will take on the gold tones of the oak barrels. Some will be left to lie for 2 years and become darker and smoother and labelled as Añejo (old). Just a few barrels will be retained for up to 4 years for bottling and labelling as Extra Añejo. And as the exception proves the rule, just a tiny favoured few barrels of Tequila were kept for 10 long years to create the ‘Los Hombres’ special edition. Much evaporates as ‘the angels’ share’ and what remains is the share of ‘Los Hombres’ (the men) and perhaps some of you one day will be favoured with a sip! All our bottles are finally hand labelled, hand numbered & bottled at La Alteña. Perhaps now you understand Villa Lobos didn’t just happen… it’s the culmination of generations of nature and nurture.